I added dampers to X, Y and Z. They were quite easy, easier than Y for sure! Yes, you can use those screws. The dampers come with screws for both sides too. Both work fine. As long as you have the damper flange with the through holes on the motor side and the flange with the threaded holes on the mounting side to the TAZ, orientation doesn't matter. Well, I am done with the Y axis. took me about an hour and a half to remove, install the bearings, the new rods, and the dampener all for the Y bed. My panavise jr was barely up to task of bending back the bearing holders to get the bearings out. It was easier to put the new steel bearings in than it was to get the old ones out, probably only because the polymer ones have an end on them that has ridges, and that sort of digs into the skin a bit when you push against it with your thumb, unlike the steel bearings which are smooth. Also, I think those bearing holders actually got bent a little bit, because when I went to install them on the Y plate (on most printers it is called the Y 'frog') the holes didnt quite line up as easily as before. Once I snugged all the bolts, I loosened them back up and re-snugged them and they went back in a little easier, basically I think I was bending back the bearing holders flat against the Y frog the first time. Next up is the Z dampers I guess. and dang it I have the bed oriented wrong! most annoying, but maybe it will fix the sound of the y travel. Metal bearings on metal rods are going to be a little raspy and loud. A little machine oil will help. You probably won't notice it when in operation. Last edited by mhackney on Wed Nov 04, 2015 9:20 am, edited 1 time in total. Thanks, Yea, when I flipped the Y bed around to proper orientation, some of the noise went down and motion got WAY SMOOTH actually. And dont worry, I have these things PLENTY lubed. I accidentally spurt out way too much one of the bearings, and I am running the plate back in forth to sop up some of the oil that is running everywhere with a paper towel. I had to do some other things right after installing the Y axis upgrades, but eventually I finished up the upgrades this weekend, maybe a total of 6 hours. The Z axis was the easiest by far, since everything is separate. The X axis seemed the toughest to me, but I just had a hard time getting one of my old rods out of the brackets. After that it was relatively smooth. I havent actually finished connecting everything back up, as I mean to do normal maintenance at the same time (grease the z lead screw and put on a fresh PET film on the bed). I will be back up and running in no time. Then I will re-calibrate perhaps using mhackney's guides this time to see just how tuned in I get my machine! I will evaluate during calibration how the upgrades all turned out. I cant wait to hear a quieter machine! I completely agree with what you said in regards to the brass threaded inserts, having such good quality parts will definitely make the build more powerful. My machine is fully up and running, and these upgrades made a big noticeable difference. My test prints all came out significantly better than my previous time. The whole thing is awesomely quiet now too. I am going to be doing these upgrades for sure, first things first though I need to get the octoprint up and running on the bb black I got. as far as your plans for making it dual printing with the cyclops, how do you plan on dealing with the changeover time between colors? do you just use the changeover period for infill? developed a 3 point bed mounting system with FSR (force sensitive resistors) at each point for auto bed leveling and Z homing. No probes and you can print all the way to the corners and edge as there is noting to interfere. upgraded to an E3D Cyclops dual extruder - this is the version with 2 input filaments and 1 nozzle. 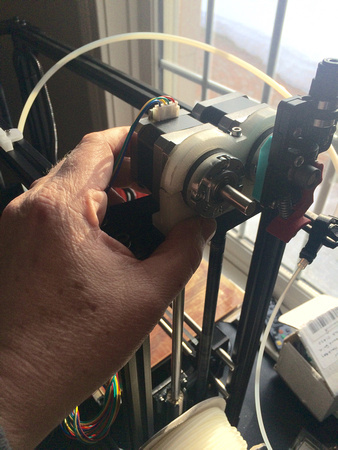 The E3D Chimera has the same form factor and could be used instead - it has 2 filament inputs and 2 nozzles. This upgrade includes a mount for the TAZ carriage that I'll post later. upgrade to 2 SeeMeCNC ezStruders with geared steppers mounted on the upper cross frame with Bowden tubes to the hot end. 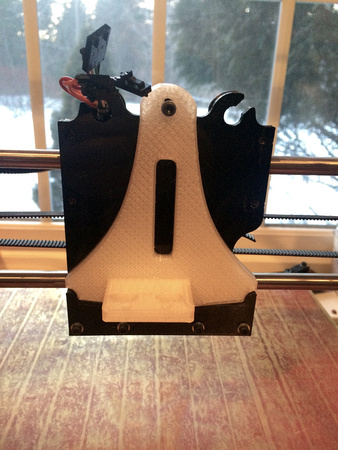 This removes a lot of weight from the carriage (less sag problems, faster travels/prints). 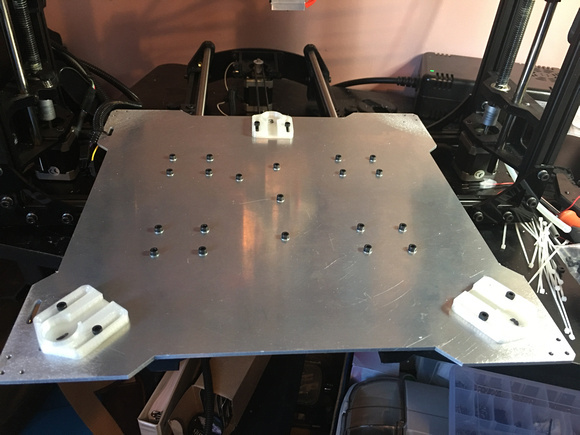 This upgrade includes the dual stepper mount, geared stepper adapter. 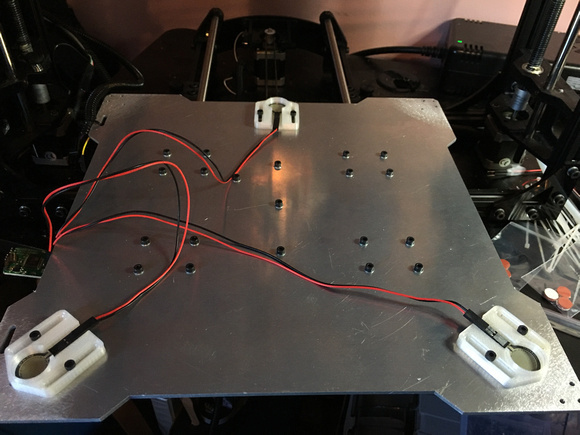 I used the existing connectors to the electronics box and added new pins where needed to support the 2nd stepper, a hotend cooling fan and the 3rd wire to the Z endstop to support the FSRs. This makes for a relatively neat assembly. Marlin firmware changes to support the above. PID autotuning is not working - it just sits there and does nothing. I posted about this in another thread earlier today so I won't repeat it all here. Using the command "M303 E0 S200 C8" and nothing happens (the hot end does not start to heat up) in Repetier host I see it continually cycling between waiting for 1 command and Idle. Very odd. I don't see any compensation after doing a G29. The G29 probes my 3 points and reports the coordinates for each. I see that there is a little variation in Z as expected. When I print I don't see any adjustment in Z. I think I may understand this now - I issue G29 from the console and then print after its done. Apparently, G28 home deletes the transformation matrix! So, when I print there is nothing there. I need to add G29 to the gcode header after G28 and give it a shot. But I'm working on the PID now since it has to start dead cold and I don't want to heat up the hot end until it's sorted. The new Cyclops/Chimera mount. I'm still working on a fan attachment system. 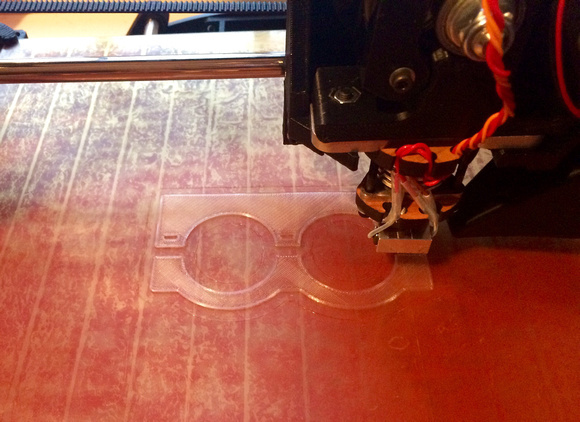 The dual extruder mount being printed. and an early prototype so you get the idea. Here's the 3 point FSR mount. I designed these for my delta printers but they work just as good here.